My problems started the summer before I entered seminary. It occurred to me, despite being a Christian since the age of nine, I had never read the Bible from cover to cover. This hardly seemed fitting for a prospective minister, so I decided to start in Genesis and plow my way through. And I quickly discovered some material that was both new and disturbing. I hadn't even gotten to Exodus before encountering a bunch of angels who visited earth to have "relations" with human women, giving rise to a race of giants known as the Nephilim. As you might imagine, this wasn't one of the flannel-graph stories I had heard in Sunday School. Then there was the story of Elisha in 2 Kings. At one point, this great prophet was taunted with "You baldhead!" by a group of young boys. 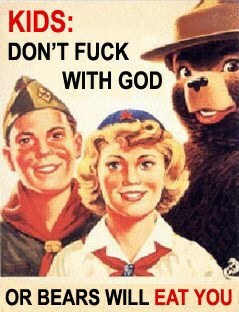 In response, the man of God cursed the kids, whereupon two bears emerged from the woods and mauled 42 of them. In all my years of church attendance, I had never heard a sermon on this particular tale, and several issues became apparent upon reading it. First, it seemed like Elisha--being a prophet and all--could have been a shade more thick-skinned about these jests. But even worse, how in the world did 2 bears maul 42 boys? After the first 6 or 8 went down, you'd think the rest of them would run like hell. Fortunately, I was about to move from Tennessee to Northern California to enter a Southern Baptist seminary, and I was certain that all my questions about the Old Testament would soon be answered. In fact, new questions emerged during my education. I discovered, for example, that although my denomination made a huge issue of the Bible's inerrancy, this concept only applied to the original manuscripts--which no longer exist. Everyone acknowledged textual issues with the copies of biblical books we rely upon today, so why were we arguing over some theoretical concept that had no bearing on our current Bible? I also learned that other cardinal doctrines, such as the divinity of Christ and the Trinity, had been hotly debated in the early Church and only codified by Church councils centuries after Jesus' life. But now we had to believe these things to be acceptable to God? Duly alarmed, I chucked the whole Christian enterprise and dropped out of school, right? Well, no. In truth, there was no denying that faith had exerted a positive influence on my life, particularly when I went through a dark period during college. And I liked being a believer, especially the relationships I had with Christian friends. So although the "answers" I was given to my doubts were not entirely satisfying, I stayed the course. For my first few years after seminary, I made use of my undergrad degree by working as a environmental engineer, and my wife and I started a family. But when the opportunity came to join the staff of a growing Baptist church just north of San Francisco, I jumped at it. For six years, I preached sermons, led small groups, and recruited Sunday School teachers--and enjoyed it. I had plenty of friends, meaningful work, and a good life. But the doubts never went away. In fact, new ones came along. Like the time our denomination issued a public apology for slavery--approximately 150 years after the fact. If we were really being led by God, why did it take so long to get on the right side of what is, to put it mildly, a rather clear-cut moral issue? This made me wonder if we would be apologizing to, say, the gay community in another 150 years (let's make it 200 to be safe). Then there was the time I attended a pastor's conference where the featured speaker was a famous Christian pollster. He revealed reams of statistics showing that the behavior of Christians regarding divorce, suicide, domestic abuse, etc. was no better (and in some cases worse) than that of non-believers. One got the sense that this was somehow the fault of us ministers for watering down the Gospel and such, but a simpler solution occurred to me. What if Christians acted the same as everyone else because we WERE the same as everyone else? Also, my background in engineering left me unwilling to believe that scientists were spoofing us with this whole evolution thing. Did Bible college-educated preachers really know more than biologists and paleontologists who devoted their lives to the study of this topic? To me, this didn't seem likely. I could go on, but you get the idea. These doubts accumulated, and shortly after I left my original church to start a new congregation, I realized that to be successful in such an undertaking, I had to be 100% on board. And I wasn't. So after a very difficult period of soul-searching, I left the ministry and, eventually, the faith. Now I'm working as an engineer again and loving it. I'm also loving that I can pursue truth without asking if the truth fits into my predetermined theology. I even see some of my old Christian friends from time to time, and most of them are surprisingly understanding about my new views. (Sure, there was the one guy who yelled at me in a Mexican restaurant, but even he later apologized.) These days, I'm mostly trying to figure out how much I should "live and let live" and how much I should advocate for the atheist/agnostic vantage point. Visiting this site is one step toward figuring out that balance. Thanks for reading my story. And if you find fault with it, I promise not to summon any bears out of the woods.